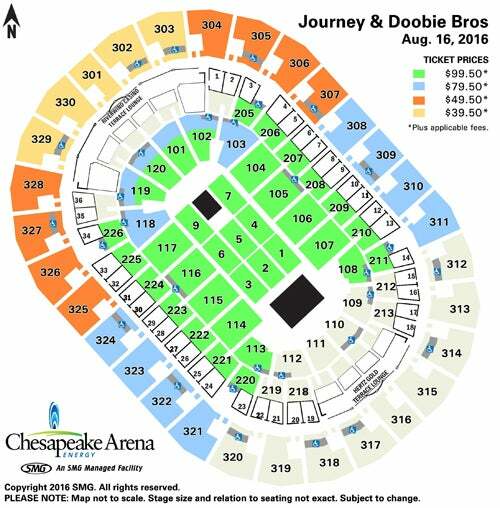 JOURNEY and THE DOOBIE BROTHERS will bring the “SAN FRANCISCO FEST 2016” tour to the Chesapeake Energy Arena on Aug. 16, bringing together two of the iconic groups that helped define the "San Francisco Sound." The tour, produced by Live Nation, includes special guest DAVE MASON and tickets go on sale to the general public Saturday, December 5, 2015 at 10:00 AM and will be available at the arena box office, by phone at (800) 745-3000 and at Ticketmaster.com. Oklahoma native Neal Schon (founding member and lead guitarist), original member Ross Valory (bass), and longtime members Jonathan Cain (keyboardist) and Arnel Pineda (lead singer), are welcoming virtuoso drummer Steve Smith back into JOURNEY, marking the first time he will perform with the band since 1998. Schon and Smith have always remained close friends and musical collaborators. Smith has lent his incredible talent to several of Schon’s solo albums, including critically acclaimed The Calling, and, most recently, Vortex. THE DOOBIE BROTHERS’ Tom Johnston (founding member, vocals/guitar), Patrick Simmons (founding member, vocals/guitar), and longtime member John McFee (guitars/strings/vocals) are adding Little Feat co-founder, Bill Payne, to their band on the 2016 tour. Payne performed on many of THE DOOBIE BROTHERS studio albums as well as on the road; a relationship the band is looking forward to rekindling. JOURNEY VIP Packages and THE DOOBIE BROTHERS VIP Packages will both be available through VIP Nation. For more information, visit http://journeymusic.com and http://doobiebros.com. Children who have reached their 2nd birthday will require a ticket.